Pre-drawn pyramid diagram symbols like basic pyramid, inverted basic pyramid, triangle pyramid, circle pyramid, 3D pyramid and more help create accurate diagrams and documentation. 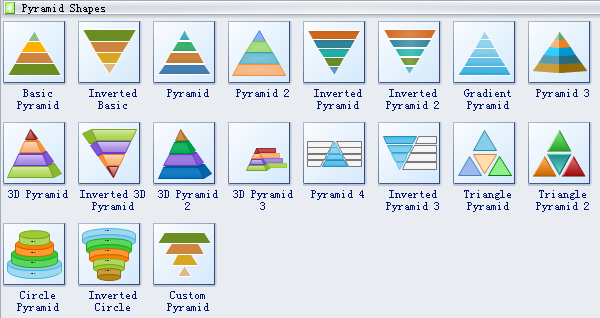 Pyramid diagram software offer you plenty of special shapes, basic pyramid, inverted basic, pyramid, Gradient pyramid, 3D pyramid, triangle pyramid, circle pyramid and custom pyramid. All these special shape will make your pyramid diagram look unique and attractive. 3D pyramid is the three dimensional pyramid. Inverted pyramid is a upside-down pyramid. Stamp is a small adhesive piece of paper stuck to something to show that an amount of money has been paid, in particular a postage stamp. Kabom is used to represent the sound of a loud explosion. Wow is used to express astonishment or admiration. Do the followings to open and use this group of symbols. Choose Business Diagram category under Available Templates. Double click the icon of Pyramid Chart in the Templates window. If you are drawing other kinds of diagrams and don't want to restart Edraw, you can open Pyramid Diagram Shapes in another way. Scroll down to rest the cursor over the title: Business Diagram to show its drop down menu. Drag the shape needed onto the canvas. The shape is selected by default with a dashed line around the shape with green selection handles. Drag the handles at corner to adjust size while remaining aspect ratio. The handle dragged turns orange. Drag the left and right handles to change shape width. Drag the top and bottom handles to change shape height. 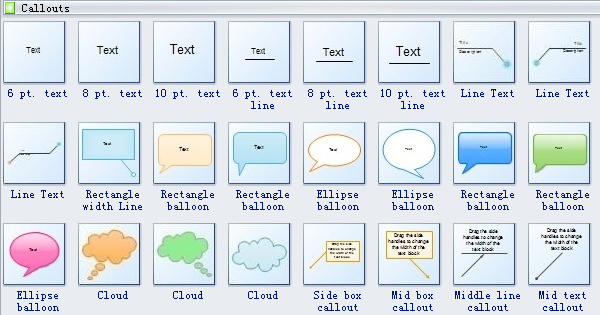 Drag the yellow control handle to change text box size. Use the floating action button to add/delete/move level or set interval/level number. 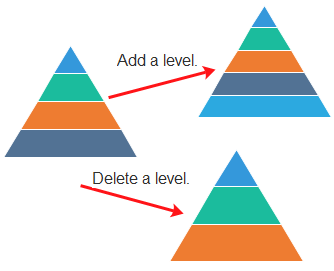 For most pyramid shapes, you can add or delete a level by using the floating action button. You can also set any number of levels as you wish. The interval width can be changed through the menu of Set Vertical Interval. Specify the interval width you need in the pop-up dialogue box. In most of the shapes, each level has its own floating button. Hitting on it can insert/delete level, move up/down the level. Click on the shape firstly, and then click on the target level. After the level is selected, its floating button shows. 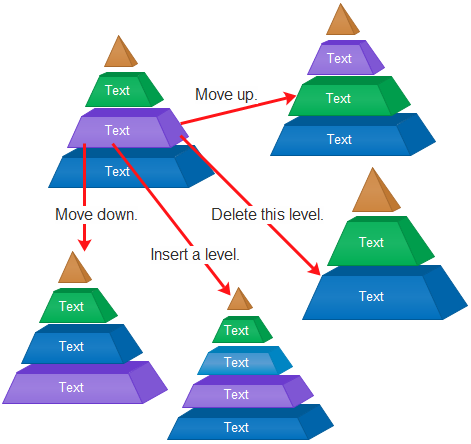 Inverted Pyramid 3 and Pyramid 4 are special shapes with intelligent text blocks. In their floating menus, you can choose to hide/show the left text or right text. In addition, you can adjust the text block size by dragging the yellow diamond control dot. Need fresh looking pyramid diagram symbols for your design? These pyramid diagram symbols are a cinch to pop in. And their crisp, fine detail will make spectacular, easy-to-understand diagrams and presentations to your customers.